Until the late 1800s, baseball umpires did not use any signals. 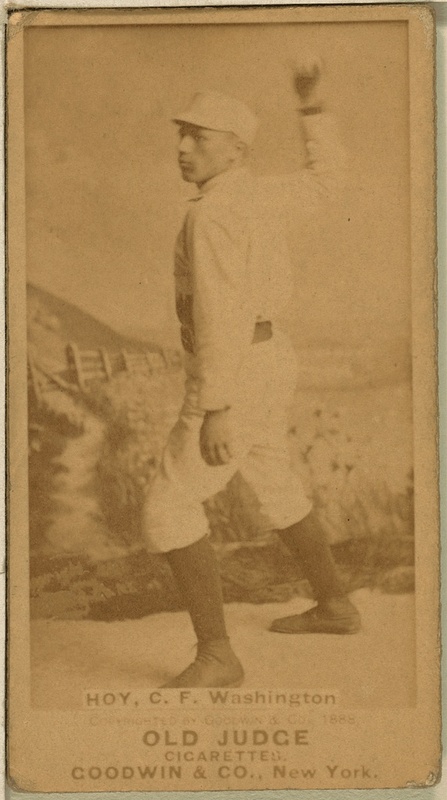 Some historians credit William “Dummy” Hoy, a deaf player with the Washington Nationals, with introducing hand signals for balls and strikes, safe and out calls. Others, credit umpire Bill “The Old Arbiter” Klem, who began officiating two years after Hoy retired, with inventing hand signals (Baseball Hall of Fame). 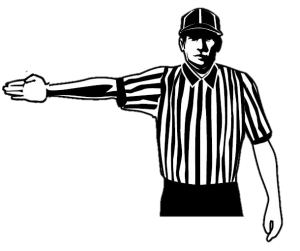 Whomever was first to ask for or use signals, few of us can imagine any sport without thinking of: the touchdown or goal signal, the safe or out call, winding the clock, first down point, the half-bird and the full bird! The consistent use of clear, crisp, and confident signals are essential to good officiating. Players, coaches, fans, table personnel and crew members all need to know what is happening at all times: whether play is stopped, the direction play is going, what the violation is and whether or not the clock is running. Often times it is too loud to hear; crowd noise, wind, or other sporting events going on nearby make it difficult to hear what an official says. Signals allow us to effectively and quickly communicate what is happening and thus manage the game. Focus on these four things and your signal game will improve. Be clear, crisp, consistent and confidant! Mostly we want to remain in the background during a game, however, when we signal, we need to be the center of attention. Grab folks attention with your whistle or by saying “Table!” MAke sure folks are watching and listening before you signal. Repeat if necessary. Make sure players are out of your way when signaling, get to a spot where you can be seen. Do not make it difficult for your partner, the benches and table to find you! Especially if teams are in a huddle or they are going to the sideline during a timeout or in between period. Be BIG and loud. If you are an experienced official, you can elevate your game to the next level with clean, crisp, consistent and confident signals. You need to developing the muscle memory so that you no longer need to think about what you are doing, but simply react to the situation with the correct;y executed sign. Often times in training you hear, “imagine you are on TV when giving a signal or reporting a foul. Channel your inner Ed Hocculli.” Well, allow me to let you in on a little secret. You don’t imagine that there is a camera recording you; there is ALWAYS a camera recording you. You are on TV whether you realized it or not. If you are just starting out, good signals are one of the few things you can control early on as your rules knowledge and understanding of the nuances of the game only come with time and reps.
We often see sloppy mechanics on the ready for play signal. Tuck your thumb when pointing, arm should be straight and down the line to the goal you are covering on a faceoff or towards the direction of play on a restart. Sometimes you see wing officials point at the officials conducting a faceoff to indicate the field is ready. This is not the mechanic and while it can be effective in good weather, it can cause problems in cold weather when the crew is wearing black jackets or rain when visibility is limited. Another area of concern is the gain the attack box signal. Be sure to hold you hand up for a moment so that your partners can see that the count has ended and then point to the box. 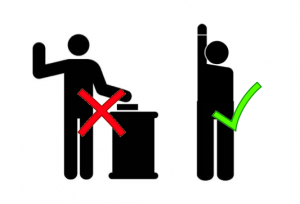 It is imperative that you use the appropriate signal and do it right! Another situation where this mechanic is very important is on Deep Restarts. The Trail official must wait on his partner to let him know that the player with the ball on the far side of the field is in bounds before he can blow the play in. That signal must be crisp and clear! Hand should be all the way up for a dead ball signal: not a “I swear to tell the truth, the whole truth, and nothing but the truth” up, but “oooohh! pick me! I know the answer” up. If it is dark or raining, make an extra effort to be sure that you are in a position to be seen! Get to your spot and plant your feet. Often times officials have “happy feet” and are dancing around while they report. This is a time to slow down and be seen. Do not rush. Coaches need to know what is happening so they get the right subs in the game and call a play, the table needs to record the foul and make sure they know when the player should release, the fans want to know. Be sure to get the tables attention (e.g. “Table! ), and go through the CNOTE sequence. Make sure that you also know the proper signal to give. Illegal Procedure really doesn’t tell anybody anything. On a faceoff is someone is holding, give the hold signal, if a player is withholding use the withholding signal. If a player moves early, just point the direction play is going and give a color! A classic example of this is the illegal substitution call. A player runs on the field, quickly realizes he should not be there and runs off. If you illegal procedure for too many men you really have not communicated anything to anyone. 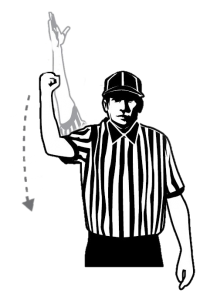 If you signal offsides, coaches, players and fans will quickly count and assume that no violation has occurred. But if you signal Illegal Substitution, everyone will know something happened in the substitution area. Eric Evans has a great line he uses in his pregame. Echo and Mimic. 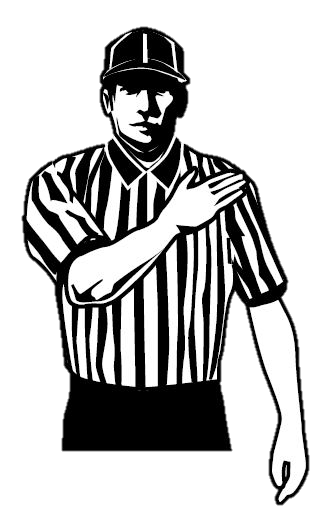 All officials should do do and repeat these signals every time. This makes sure that everyone, players, coaches, crew are on the same page. Every time you stop and start play you must have a loud whistle and a crisp signal. That tells your partner on the far side where the ball is going, and it cuts down on the coaches disputing your call because you sold it with conviction. 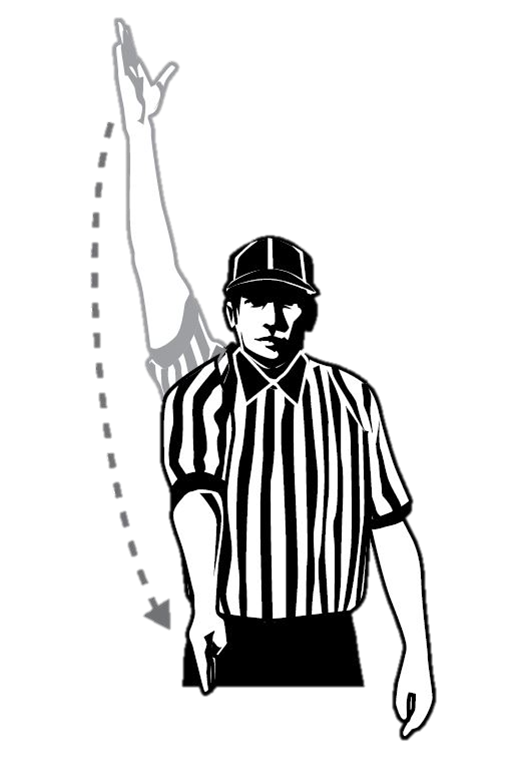 Blow the whistle and signal dead ball simultaneously when there is an action requiring a stoppage in play. 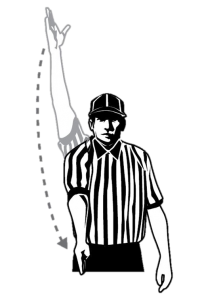 Hand up/whistle: STOP Play; hand up indicates the play is dead and the clock is stopped. Hand back up until restart. Play is STILL dead and the clock is stopped. Blow ball back in and wind arm. This is important for a number of reasons: we need to stop the clock, give the direction and allow coaches to sub and set up a play, partners to get into position and restart the clock. Don’t leave people guessing! Don’t be lazy, do the entire sequence. After goal with faceoff pending. This is an important mechanic to keep the game moving! You may not have an issue all game, but when you do you need to be ready to make the call! If necessary verbalize “He’s in!” to be sure whoever has the count ends it. We need to make sure everyone knows the count has ended and over and back is now in play! 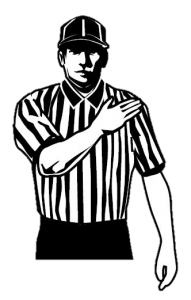 All officials should echo this signal to remind themselves and the benches that the box has been gained! Meet the moment: big calls need more energy. We often talk about selling a call: be big, loud and energetic! But not all calls need to be sold. Sometimes calmly pointing the direction or giving the push signal tells your partner, the coaches, players and the crowd, “hey guys, that was an easy one.” No need to make a big deal out of it. Be decisive on crease and goal calls or contested out of bounds plays. RUN in and make the call at the spot. You can point to the line, but be sure to give the correct signal (i.e. crease violation or interference). Practice these to build confidence. Repetitions help develop muscle memory, and quick, clear, crisp, calls made with the correct signal ooze confidence. Good signals and mechanics let everyone know you are paying attention, what your calls on the field are, and keep the game moving smoothly. Just remember to be clear, crisp, consistent and confident. As always, contact a trainer, assignor or board member if you have questions or would like help sorting anything out.